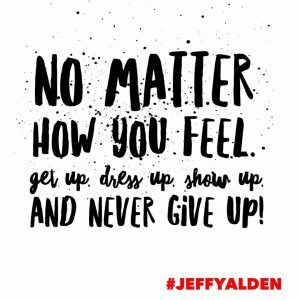 Speaker and Amazon bestselling author Jeff Yalden has been laying out daily, actionable messages in his brand-new workbook, The BOOM 28 Day Boot Camp: Creating a Life of Success. Find Motivation. Crush Goals. Overcome Obstacles. Live with Purpose. Jeff has promised that your life will change if you put the principles to work every single day. But you must be willing to put in the work. This 28-Day Boot Camp the perfect companion to Jeff’s Amazon bestseller, BOOM! One Word to Inspire Action, Deliver Rewards, and Positively Affect Your Life Every Day. NO EXCUSES! GET IT DONE! Yalden spoke to us in this episode of The BOOM Podcast from his rental car on a three-hour drive to Maine. The previous day was, let’s just say, less than stellar by any means. Jeff said he had to get his mind right and realize that today is a new day. If you have done the work and gone through Day One through Day Nine, you might be arriving at Day 10 feeling a little bit overwhelmed. This is not about perfection. It’s about progress, according to Yalden. Do you have to create more time in your day? Is your plan important enough to you to say no to something else? No to going out to dinner? No to spending so much time on social media platforms? If you make the time now to focus on your plan, you will have time to enjoy the fruits of your efforts later. Yalden is a big believer in the magic of the acronym, WIN, or What’s Important Now. “For me, WIN is that I let yesterday be yesterday. I get my head right, because I have a new day. Maybe that’s similar to you as well. Maybe you didn’t have such a great day yesterday, but you woke up this morning – you washed your face, brushed your teeth and did your dance – and you went out and kicked it, just like I have to do – and just like all of our friends and family have to do.